by Dr. Christopher Chang, last modified on 12/22/18. This section will go over a variety of reasons for a nasal sounding speech. Hyponasal speech is when there is an abnormally reduced nasal airflow during speech often in a setting of nasal obstruction or congestion. 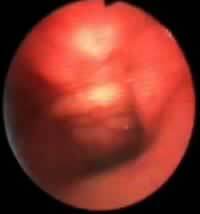 Hypernasal speech is when there is the presence of an abnormally increased nasal airflow during speech. 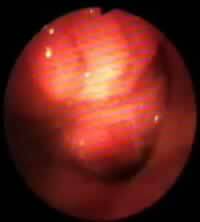 Examination is by nasal endoscopy. Click here for more information. Video of what the anatomy looks like with NORMAL sounding speech (velopharyngeal function) can be found here. One may notice that for a few of the examples below, a child is the patient. Kids older than 5 years old generally tolerate the exam well enough to follow verbal commands. Video of a child undergoing this exam can be found here. Treatment of nasal speech depends on the cause and may include surgery and/or speech therapy. Of note, Fauquier ENT is the ONLY practice in the Northern Virginia/Washington DC area that performs this type of exam (video nasal endoscopy). On an educational note, "nasal voice" is an incorrect term as the voice itself is normal. It's the speech quality that's affected. Click here to understand the difference between voice and speech. This link provides a cartoon animation of how each sound in the English language is produced from an anatomical standpoint. Click here for audio & video of what normal looks like. Photos displaying abnormalities can be found in the Photo Library. Watch a video explaining the 4 Underlying Causes of a Hoarse Voice! Note the nasal sounding speech. On exam, the palate does not move in coordination with speech. However, at other times, it does move properly. With good speech therapy, this should improve over time. Of note, the lumpy mass coming down from the ceiling is the adenoids. Note the nasal sounding speech (hypernasal). On exam, one can see air bubbles where air is escaping between the soft palate and back wall of the nasopharynx (throat). This case is different from example 1 as in this case, it never makes a tight seal. Surgical correction was by bulking up the posterior wall by injection nasopharyngoplasty until a tight seal occurred. Still confused what velopharyngeal insufficiency or VPI is? Watch this video! Example provided courtesy of Dr. James Thomas. Note the nasal sounding speech (hypernasal), especially with plosives /p/, /b/ (pah, bah) and the sibilant 'sh'. Note the air escape demonstrated by bubbles. 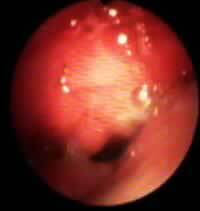 Also, the palate never really makes a tight seal with the back wall centrally known as velopharyngeal insufficiency. However, there is a lateral squeeze present. Surgical procedures to correct this velopharyngeal insufficiency focus on closing this central gap without affecting the lateral aspects. Such procedures include posterior pharyngeal flap (see example 6 below) or posterior pharyngoplasty (injection or graft). In this child, the tonsils and adenoids aid in speech and removal may result in worsening of speech quality. This small opening can be easily resolved by injection nasopharyngoplasty. Compared to the prior example, this child who is also after cleft palate repair has nasal speech due to a very large central velopharyngeal insufficiency. There is some degree of palate elevation as well as lateral squeeze, but not enough to provide complete closure which is always present. In the distance, you can see the child's epiglottis. The prior examples #3 & 4 were all due to central velopharyngeal insufficiency. However, lateral velopharyngeal insufficiency also exists, but is more rare. This example shows a child without any history of cleft palate who has a small insufficiency on the right side. Note the bubbles that emanate from this small opening. There is a nice tight closure elsewhere. It seemed that the child had a temporary mild right soft palate paralysis that resolved spontaneously along with resolution of the velopharyngeal insufficiency after about 1 month. This adult patient underwent pharyngeal flap surgery to correct a central velopharyngeal insufficiency after cleft palate repair as a child. Note the bridge of mucosa from the soft palate to the posterior wall which is the flap. When relaxed, there is an opening on either side of the flap (called "lateral ports") to allow for nasal breathing. When talking, the lateral ports close to prevent air escape. The risks with the procedure include creating too small a flap which would result in persistent hyper-nasal speech (see next example) or too large a flap which would result in nasal obstruction and a hypo-nasal speech. A skilled plastic surgeon is able to create the perfect sized flap that's not too large or too small as in this case. This adult patient underwent pharyngeal flap surgery to correct a central velopharyngeal insufficiency after cleft palate repair. Unlike the prior example where there was complete closure of the lateral ports with phonation, this unfortunate patient has a small VPI on both sides (note the bubbles). In order to resolve this VPI, the patient used an obturator in order to completely close the lateral ports thereby eliminating his hypernasal speech. However, use of an obturator resulted in near-complete nasal obstruction. Watch the video which shows a small VPI without the obturator as well as VPI resolution with obturator (along with nasal obstruction). This patient underwent pharyngeal flap surgery to correct a velopharyngeal insufficiency after cleft palate repair several years prior. However, unlike the prior example #6 which is a perfect outcome, there is a persistent large opening on the left side resulting in a large left velopharyngeal insufficiency causing hypernasal speech. Also, the pharyngeal flap is shifted right of midline instead of being perfectly in the middle. This patient's pharyngeal flap failed in 2 aspects resuling in VPI. First, the flap was created right of midline resulting in no lateral port on the right and a very large left lateral port. Second, the flap was made too small so even if the flap was perfectly in the midline, most likely VPI would still have occurred. Note the nasal sounding speech (hyponasal). On exam, the patient also had fluid in the ears. Looking in the back of the nose, large adenoid tissue is seen which looks like a pink cauliflower growing down from the top. The adenoids are so large that they are obstructing the eustachian tube opening preventing adequate ventilation with the ear resulting in fluid build-up. The large adenoids is the cause of the nasal sounding speech. 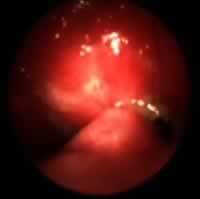 Treatment was adenoidectomy (adenoid removal). Watch a video of an adenoidectomy being performed. 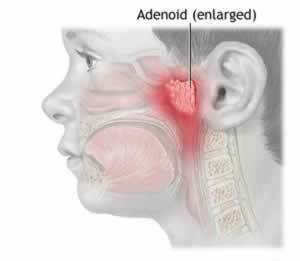 Read more about large adenoids here. Other common anatomic causes of hyponasal speech include deviated septum, turbinate hypertrophy, and allergies. Often these issues along with large adenoids cause a "snotty" nose in kids.